I wonder if you’re sat reading this as a distraction. Why are you always thinking about food? Wondering if anyone has noticed how many times you went back to the cake table at work. The fact that you don’t even know when you are hungry anymore because you just eat, for any number of reasons, and perhaps there doesn’t even need to be a reason. Just the fact that you know those biscuits are there, in the tin, so you just have to eat them. Did You Even Taste It? The thing is though, you do eat them, you eat them all and you haven’t even tasted them. They are just gone. Just like that. Then the next thing you know you are kicking yourself because you ate an entire sharing packet of minstrels, feeling a bit crap about yourself and the rolls you get when you sit down. Trying to justify it because the packet is smaller than it used to be anyway. It’s like you are in a war with yourself. One part of you cheering you on, telling you to have it, it makes you feel good, then it’s like that other part of you, that quieter voice that is saying “what are you doing this to yourself for, you don’t really want it”. So you’re stuck in a cycle of edible happiness and bloated misery fuelled by your food of choice. I get it. You feel like there is nothing you can do, no matter how hard you try, that sweet deliciousness that you love is calling you, and everyone else is skinnier than you and more in control. But I promise you, you are not the only one. 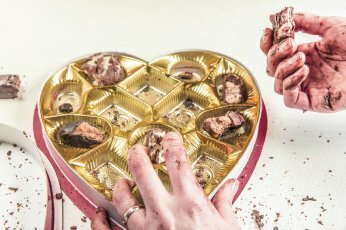 There are men and women just like you if you look around, criticizing and judging themselves, annoyed for being the fat one in the group, but just can’t seem to stop eating their feelings. I want to show you that it can be different. You can be more in control and you can feel better! You can change your cravings, you can quieten that voice that goes on and on at you to eat the things you know you shouldn’t be indulging in so often. You can change everything about how you manage your emotions, there is a better, more productive way to do that and I can show you how. It doesn’t take forever either. A matter of hours in fact. You can work with me on a 4 or 6 session package, and your emotional eating can be a thing of the past! Imagine, not wanting that doughnut, browsing the buffet and eating what you want until you are comfortably full, imagine being able to say no and feel good about it. Maintaining that shape and size that you want to be! How fab will you look! When you are ready get in touch and let’s talk about the right way forward for you. 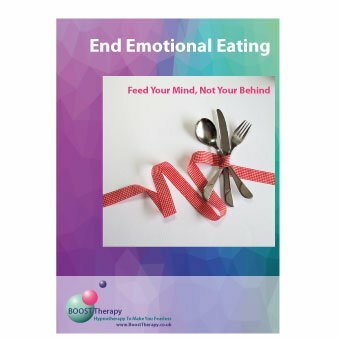 If you are not sure, perhaps you might like to work at your own pace and take advantage of the End Emotional Eating program you can download and master all in the comfort of your own home.